Anok of No Quarter is seriously on the cutting edge of plastidip over at his blog, Wrapshot. 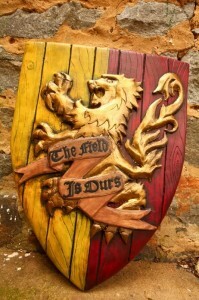 My favorite right now is (His Royal Highness of Darkon) Slindar’s Shield. Dig that crazy action. We also added a lot of his pics to the gallery – if you have more boffer treasure that we can stockpile, let us know. New guides are up for Belegarth Rocks. We know rocks are a novelty weapon, but they’re real and they’re happening and we’d like you to know how to build them well. Read up, or get hit in the face with a really good looking brick. Also, the same article covers spellballs for use at Dargarth, Darkon, etc. Spellballs are rock-like projectiles that represent spells. They’re pretty similar in construction to rocks. If you’re a caster at a boffer larp, this guide will show you how to make spellballs. There are two new guides posted in the Guides section under the Bluesword page: the Eryndor Method and the Box Method. 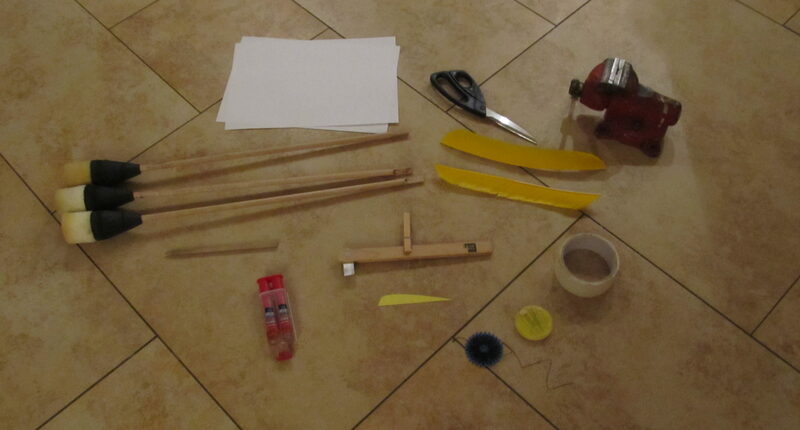 They are only methods for building the blades of swords and do not include directions for a guard, handle, or pommel. Those three things will all get their own guides in the (near) future. The Dagorhir realm of Eryndor has provided a number of great blue weapon builds. Hail Eryndor! Some of these guides have some dated techniques or materials. Bluesword (swf) — This Guide is one of my favorites. It is very well put together, clean and thorough. The only downside to the guide is that it suggests PVC for a core. PVC is acceptable for first time or quick and dirty builds, but for a weapon that will be around for a while, fiberglass is the preferred core. For a one handed sword 1/2″ round fiberglass rod is good. EVA Bluesword (pdf) — I like this guide for how thorough and concise it is. It also suggests the use of higher quality materials (fiberglass and EVAlite). There are only two flaws with the guide. Primarily, all of the color coding can be a bit overwhelming initially. Second, the guide suggests duct tape on the striking surface of the weapon. In my experience, a well constructed weapon shouldn’t need any tape to hold it together and duct taping along the flat of the blade is more for reinforcement. I have seen foams shear along the edges of tape (bluefoam can be especially notorious for this) on striking surface. Stabby One-sided Bluesword (gif): — I have to admit, I’m not particularly fond of this next guide. Double-coring (when two small diameter cores are used) is an acceptable method, but not ideal. Furthermore the guide suggests the use of an open cell foam for the stabbing tip. Modern stabbing tip technology uses either Yoga-mat or Marinefoam (aka Ensolite) (Ensolite can also be found from seat cushions). A discussion of stabbing tip foam can be found here. Lastly, I dislike the profile of this weapon. Due to the use of open-cell foam, the sword needs to be reinforced along the flat to prevent the tip from blowing out. 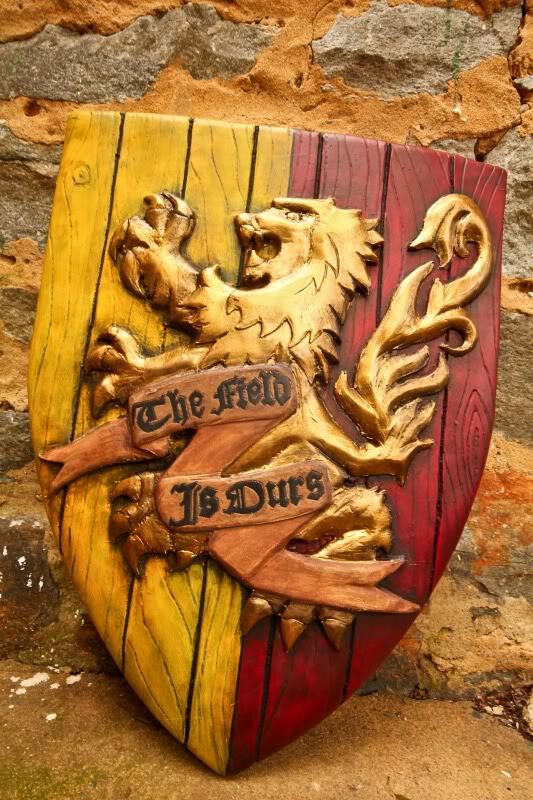 The Universal Larp Association has a writeup of Boffer Larps and why they matter. This site aims to be a resource for all foamsmiths, but boffers in particular. Full disclosure, the current staff of foamsmithing.com all play Dargarth, a Boffer Larp. It’s a larp website that hasn’t be updated in two years. It ought to be Dagorhir’s weapons forum, Belegarth’s weapons building forum, geddon.org, or nearly anything other than a vastly scattered, unuthoritative list of broken links. We will try to fix this by distributing our knowledge as best as possible! If you are interesting in helping us highlight the best of foamsmithing on the web, email contact@foamsmithing.com. Thanks! New tool – Resin Utility Knife! BRACE YOURSELVES: I found an inexpensive yet amazing foamcutting knife at Fred Meyer the other day. So far, I have only used it to cut foam for blueswords, but man, it is cheap and sturdy. I’d been using packing knives, pocket knives, box cutters, etc. for a while, but its difficult to get them to make perfectly clean cuts. They squish the foam and cause uneven edges. Even with making guide cuts first, instead of just trying to cut all at once, the cuts often end up sloppy. I had heard that steak knives worked well for cutting foam, but hadn’t tried yet. I found a pack of 2 cheap steak knives at fred meyers and grabbed them to test. Unfortunately they were only beveled on one side, so the tendency of the blade cutting the foam was to slide off the side and create a bevel. They still worked fairly well but I had to be very careful and make many cuts, switching directions to keep the cut flat. The next day I went to Fred Meyer again for a supplies run, and ended up buying probably the last knife I will ever need for foamsmithing. I had seen it the previous time, but thought that the 5.5″ blade would be unwieldy, fooling me into getting the aforementioned steak knives. It was also cheap (about $7 with tax) so I grabbed it. 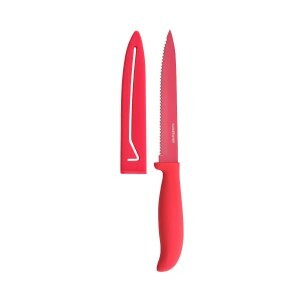 The serrations are much smaller and sharper than the steak knives, the blade is thinner, stiff, and beveled on both sides. This knife is WIN. It was very easy to make clean cuts on 4# gym mat foam. In short, this knife is awesome, and it cuts foam like a lightsaber. A quick update and teaser. I’m working on a detailed and picture heavy guide for constructing a bluesword using the box method. 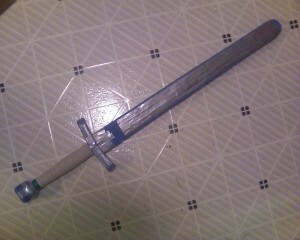 Here’s a pic of the sword nearing completion! It is often said that the first weapon any aspiring foamsmith should build is a ‘bluesword’, so we’ll start at the beginning. Blueswords are the single most common weapon on many fields. The term bluesword comes from Belegarth, referring to the color used to mark single handed weapons. Arguably the term may also come from the blue color of the foam most widely used in foamsmithing, the Ozark Trail Camping Pad from evil Walmart. ‘Bluesword’ describes any one-handed weapon, constructed in a flat-bladed manner (versus a club or an omni-blade, a discussion for later). Lengths vary widely according to personal preference and stylistic choices, but 48″ is an upper limit for Belegarth and Dagorhir. Hilts and pommels are also infinitely varied in style. The box, an old and tested build. Here’s the box method from Geddon.org. Strips of foam build up a ‘foam sandwich’ around the core which is reinforced by more foam, in layers. The fry method, where the entire blade as one piece of foam. A channel is routed in it for the core, and then the core is glued in. We’ll be posting guides to each of these methods, and some of their variations, in the near future.